In 5-quart Dutch oven, add 7 cups of the chicken broth, the salt and pepper; heat to boiling. Add orzo to broth; reduce heat to medium, and simmer uncovered 7 to 10 minutes, stirring occasionally, until orzo is tender. In 2-cup glass measuring cup, add remaining 1 cup broth, the lemon juice and flour, beating with whisk to combine. Slowly stir mixture into soup; return to simmering. Cook and stir 1 to 2 minutes or until soup thickens slightly. Stir in chicken; cook 1 to 2 minutes or until heated through. Remove from heat; stir in butter. Divide among bowls to serve; garnish with dill leaves. If you prefer more fresh dill flavor, increase amount of fresh dill to 2 tablespoons. You may also substitute 1 to 1 1/2 teaspoons dried dill, if desired. Stir into soup before serving. 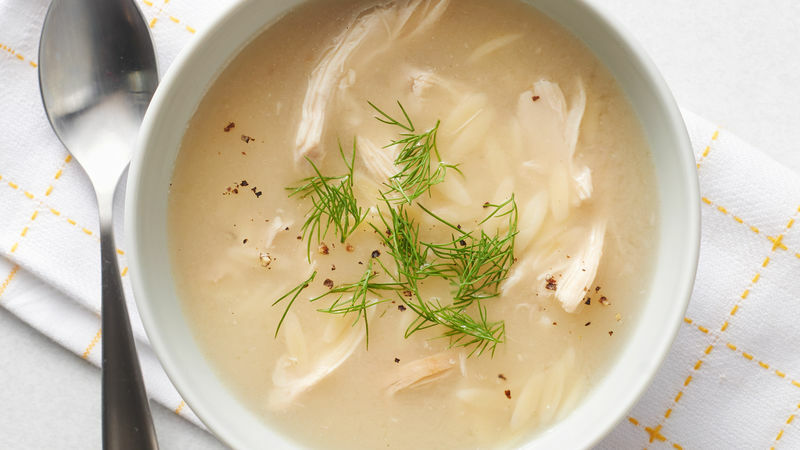 Fresh lemon juice is preferred over a bottled concentrate or juice to add a bright and fresh flavor to this soup.